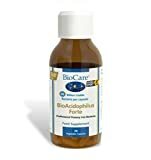 BioCare’s Bio Acidophilus Forte supplement is a probiotic that contains 30 billion live CFUs of Lactobacillus Acidophilus, Bifidobacterium Bifidus and Bifidobacterium Lactis per serving. Bio Acidophilus Forte also contains the prebiotic fiber FOS (Fructooligosaccharides), which help probiotic bacteria to colonize the gut. Probiotic supplements come in a wide range of species, strains and doses, making it difficult to know which of these healthy bacteria may be helpful for the symptoms being experienced. For many individuals, selecting a quality daily supplement like Biocare’s Bio-acidophilus is an easy answer. This highly potent probiotic product combines several strains of beneficial microorganisms – chief among them being Lactobacillus Acidophilus. Together, the strains found in Bio-acidophilus have been shown through scientific research to improve digestion, inhibit growth of unfriendly bacteria and, in the higher doses, to replenish the microflora of the gut after a significant disruption has occurred. When probiotic bacteria are ingested in adequate numbers, they can accomplish many tasks. For example, if the digestive tract has been disrupted because of antibiotic medications, restoration of the healthy bacteria can be aided with administration of large quantities of beneficial microbes. When antibiotics indiscriminately kill off both good and bad bacteria in an attempt to rid the body of infection, it leaves a gap which sometimes allows overgrowth of unhealthy microorganisms to occur. This is why many people experience diarrhea when taking antibiotics, or immediately following a course of antibiotic medications. By taking capsules or pills containing adequate quantities of probiotic bacteria known to naturally inhabit the gut, fast and effective restoration can occur. Besides being useful for restoration of the balance in the microflora, Bio-Acidophilus is also taken by many health conscious people as a daily supplement to modulate the growth of pathogenic bacterial agents throughout the small intestine and colon. Individuals experiencing symptoms of digestive dysbiosis like gas, bloating, constipation, diarrhea, abdominal discomfort, or unusual intestinal motility (speed) often find relief or decrease in their symptoms when supplementing with Bio-Acidophilus. Biocare, the manufacturer of this product line, is considered a market leader in the United Kingdom. The Bio-Acidophilus line comes in several strengths ranging from 5 billion CFU (colony forming units) to 75 billion viable cells per dosage. For restoration after antibiotic (or other) disruption, taking a dose of 30 billion or more over the course of 7-10 days should effectively restore these non-transient bacterial strains to their normal numbers in the gastrointestinal tract. Everyday supplementation is usually much lower at around 10 billion CFU taken at least two hours after a meal. Each capsule contains active strains of Lactobacillus acidophilus, Bifidobacterium bifidum, and Bifidobacterium lactis. Fructooligosaccharides (complex plant sugars) are also included which are a source of prebiotics. This ingredient is not actually a “food source” for probiotic bacteria; however, prebiotics are used as a stimulus to encourage colonization of friendly bacterial agents. Non-probiotic related ingredients include cellulose, hydroxypropyl methylcellulose (capsule), silicon dioxide and magnesium stearate. Food allergies affect millions of people worldwide. They account for billions of dollars in medical care and treatment annually. Clinical trials and lab research suggest there is a connection between food allergies and the balance, or imbalance, of the gut microflora. Natural health practitioners agree that probiotics are one of the foundations for effective allergy treatment protocols because of their effect on the barrier strength of intestinal walls, as well as nutrient absorption and appropriate immune response. Biocare’s line of probiotic supplements are completely dairy-free, the cellulose is from wood-pulp and the stearate is from palm oil. No carrageenan is used in the production of the capsule shell. This means they are vegan-friendly. Most people are able to take probiotic supplements such as Bio-Acidophilus capsules without experiencing any side effects. Those who do, report mild symptoms such as bloating, gas or abdominal discomfort which typically subsides with continued use. Some individuals may need to start with very low doses and increase weekly until the benefits are experienced. Some people should not take probiotic supplements; these include those whose immune systems are compromised due to medical conditions like HIV/AIDS and those taking medications to suppress the immune system. Pregnant or nursing mothers can generally take probiotic supplements without side effects, but because there is not enough research available, are advised to talk with their physician. Bio-Acidophilus is manufactured by one of the premier nutritional supplement providers in the UK and is considered a reliable choice for daily probiotic supplementation, as well as for restoration of the gastrointestinal microflora immediately following a disruption in the delicate balance. Available in a wide range of strengths, this product can be easily adapted to the individual needs of people with different health needs. The bacteria contained in Bio-Acidophilus is “resident bacteria”, that is to say, they are not the type of transient bacteria frequently provided in yogurt or milk products, but instead are strains known to inhabit the digestive tract of humans. Bio-Acidophilus continues to garner positive reviews from consumers for both viability and product effectiveness.